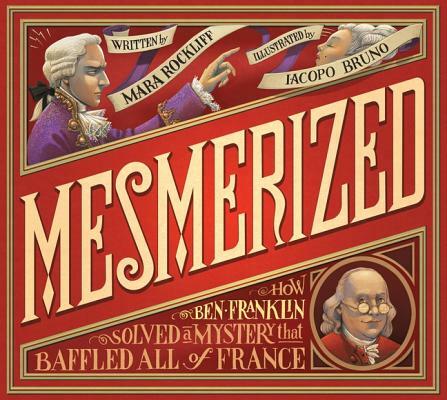 Discover how Benjamin Franklin’s scientific method challenged a certain Dr. Mesmer’s mysterious powers in a whimsical look at a true moment in history. The day Ben Franklin first set foot in Paris, France, he found the city all abuzz. Everyone was talking about something new—remarkable, thrilling, and strange. Something called . . . Science! But soon the straightforward American inventor Benjamin Franklin is upstaged by a compelling and enigmatic figure: Dr. Mesmer. In elaborately staged shows, Mesmer, wearing a fancy coat of purple silk and carrying an iron wand, convinces the people of Paris that he controls a magic force that can make water taste like a hundred different things, cure illness, and control thoughts! But Ben Franklin is not convinced. Will his practical approach of observing, hypothesizing, and testing get to the bottom of the mysterious Mesmer’s tricks? A rip-roaring, lavishly illustrated peek into a fascinating moment in history shows the development and practice of the scientific method—and reveals the amazing power of the human mind. Mara Rockliff is the author of many books for children, including The Busiest Street in Town and Me and Momma and Big John, winner of a Golden Kite Award. Mara Rockliff lives in eastern Pennsylvania with her family. A stylish and humorous exploration of the scientific method and the mysteries of the human mind. On brilliantly illustrated pages full of rococo details and beautifully calligraphed text, Rockliff tells the story of how Benjamin Franklin debunked Dr. Mesmer’s magical cure-all. ... [Rockliff's] dramatic text is perfectly complemented by Bruno’s lush, full-color illustrations, stuffed with period detail and sweeping ribbons and curlicues. Each page is teeming with personality... Together, Rockliff and Bruno make the scientific method seem exciting, and kids interested in science and history will likely be, well, mesmerized. Rockliff’s lighthearted tone and lively writing style are enhanced by the use of different typefaces and print sizes, as well as a layout that will keep readers engaged throughout. Rockliff plays with words and rhythm, making this book an excellent choice for reading aloud. The artwork is infused with humor, and the individual’s expressions throughout are a delight, from the look on the face of a swooning patient to Mesmer’s own intense glare. There is much here to draw the eye and prod discussion. ... Overall, a wonderful and fun-filled title that introduces yet another facet of a fascinating man. Besides successfully explaining the scientific method, and what we've come to call the placebo effect, author and artist give children insight into human behavior—with a large dose of humor. For history buffs, science enthusiasts, and fans of a good story, this one hits all the marks. This ingenious book celebrates — and explains to children clearly — the basic principles of the scientific method, while also doubling as a peek into the astounding life of Benjamin Franklin. Rockliff's text is engaging and lively and pairs beautifully with Bruno’s dramatic and bold illustrations, which fully conduct the audience’s attention. There is no way a reader will escape the truly mesmerizing and energetic design. Bruno's digitally colored pencil art lightly evokes period caricature and gently pokes fun at the ornate clothing and hair of French nobility. The tale is nicely pitched to emphasize the importance of a hypothesis, testing and verification, and several inset text boxes are used to explain these scientific tools. Rockliff points out that Franklin's blind-test technique is in use today for medical treatments, and both the placebo effect and hypnosis are studied today. Rockliff and Bruno's playful approach buoys solid science and history. “Mesmerized” has so much page-turning suspense that it feels ripe for adaptation and box office success.... Although the book sounds heavy with facts and theories, the story zips along thanks to Mara Rockliff’s lively, dramatic writing that holds even young readers in its thrall. Iacopo Bruno’s illustrations are stylishly elaborate, shown from shifting perspectives. And the pages are cleverly laid out to accommodate short bursts of information. It’s not typical picture book problem, but this story might be just too thrilling for bedtime. Rockliff retells the episode with equal measures of gentle satire of aristocratic gullibility and tidy re- construction of the scientific method. With several educational themes—electricity, hypnosis, the placebo effect, the scientific method, and a good dose of American and French history—this mesmerizing picture book will fascinate as it entertains. This is a great way to introduce the scientific method to students; the illustrations and text are energetic and fun. In a style that is both humorous and informative, Rockliff provides a context for Franklin’s journey to France during the American Revolution at the time of a surge in interest in science.